‘What is a recipe?’ was the simple opening question asked by the organizers of the virtual conversation hosted by The Recipes Project. This month-long online discussion has made me look at the archives of the Royal Society with different eyes. During my weekly visits to the Royal Society Archives in London I am usually searching for anything visual from the period 1660-1710. Once found, the particular page of archival material with something visual on it is added to the Making Visible database. 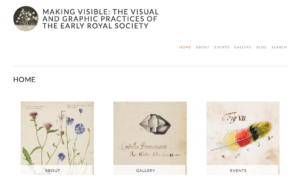 With this database the Making Visible team is creating a research tool through which it will be possible to enter the archives on image level, and ask and answer questions about the usage of images in early modern science. Have a look at our blog in case you are curious to find out more, or follow us on twitter @MVCRASSH. However, while my colleagues and I are looking for images, we also come across many other interesting documents that are currently part of the early archives. Like recipes! 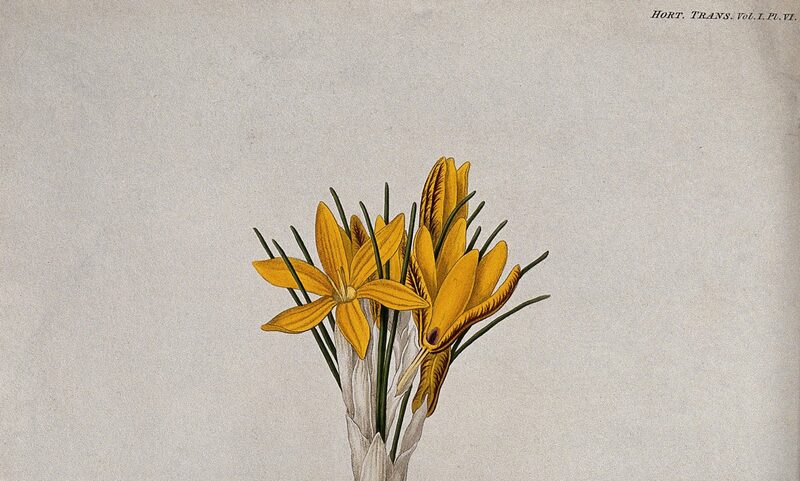 Those of you who have followed the Twitter storm during the #recipesconf might have seen that I have tweeted about recipes in the last few weeks: recipes for the making of pigments and varnish; food recipes (for bread, butter, and bacon); and medical recipes. The discussions on Twitter have made me come up with several questions. And even though there are too many questions to answer in one blog post, I will discuss them briefly, and hope to continue this wonderful conversation with so many colleagues around the globe. First of all, why did all these recipes make their way into the archives of the Royal Society? When I started working on the Royal Society materials two years ago, I did not expect to find so many recipes for making food and drinks, nor was I expecting the Fellows’ interest in the making of pigments and varnishes. 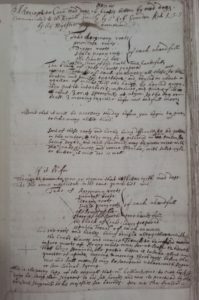 However, it turns out that the Fellows of the Royal Society were very interested in the history of trades, which made them collect recipes from artisans, including many recipes and treatises on things related the making of images, book printing, and engraving techniques. The food recipes might need to be seen from the perspective of making products in the house, with which men and women can show off their skills to their friends. During my tweet-storm, I showed a set of recipes brought to the Royal Society by John Evelyn about how to make the best French bread. But also bacon, butter, cheese, and cider recipes are part of the collections in the archives. In the case of the bread recipe we have the name of John Evelyn stuck to it. And it is indeed interesting to kn ow who provided the Fellows of the Royal Society with the information now in the archives. Who were the sources for the recipes? Were they named? Relatively often we find a name on the recipe. Many to the recipes related to the art of picture making have male names on the recipes, such as Jonathan Goddard in the recipes for colours. Between the recipes I found several had a female name on them, such as the butter recipe from Mrs Elizabeth Papworth, and the recipe for a remedy for scurvy by Mrs Bancroft. Is this surprising? Not at all, since regular readers of this blog know very well that recipes were very often collected by women in early modern English households. 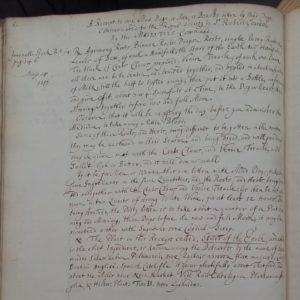 However, from the perspective of the early history of the Royal Society it is definitely interesting how recipes from women are still part of the archives. Much more research needs to be done on the women around the Royal Society. Finally, I would like to quickly answer a question that Elaine Leong raised about the many underlinings and crossing-out in a recipe for curing rabies. As I suspected the crossings were done in the original document that was brought in to the Royal Society. The recipe was thought important enough to make it into the Royal Society’s Register Book, where we find it again in volume 7. 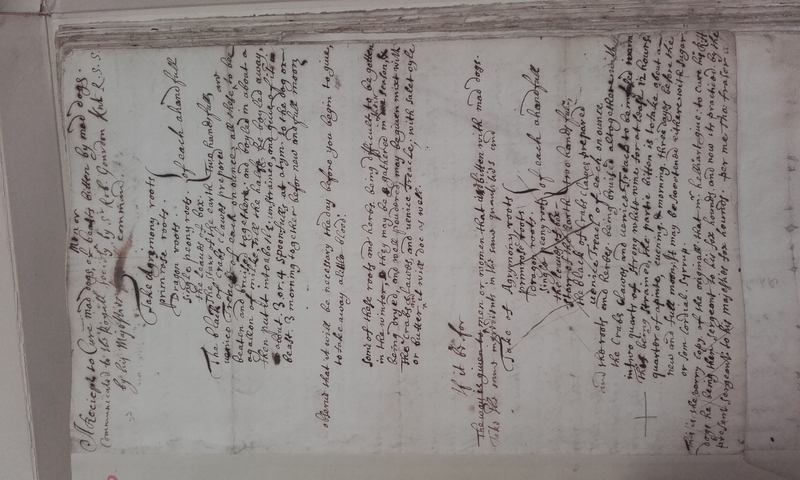 All the crossed out sections that you can see in the image to the left are omitted from the neat version of the recipe in the Register book. Also the information about the effective cure of the His Majesties’ dogs is left out. But instead we do find a short Note Bene, explaining that the plant named in the recipe as “Starr of the Earth” has several Latin and vernacular namens “known among Botanists”, which will make it easier to find this ingredient. 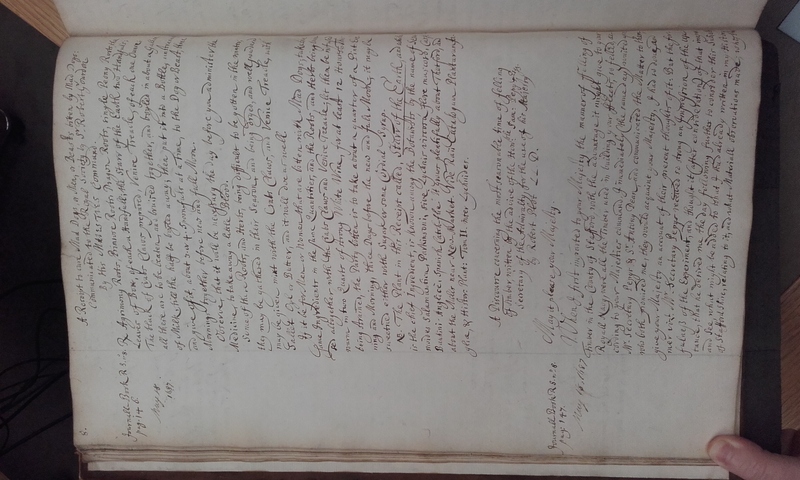 Thanks to the organisers of the #recipesconf for giving me a great excuse to look into recipes in the Royal Society Archives and for all the stimulating conversations online!